The Loggerhead Shrike is a medium-sized songbird, with a large head and a thick black, hooked upper bill. It is mostly white with grey on its crown and back, mainly black wings and a bandit-like black mask covering the eyes. Males are slightly larger. The Loggerhead Shrike may be a songbird but it is perhaps best known for its overt, often inelegant predatory behaviour. This hunter likes to perch, ready on tree branches to ambush its prey, which includes large insects like grasshoppers, but also frogs, rodents, lizards and even small birds. 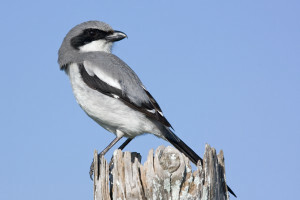 Since the Loggerhead Shrike has no sharp claws like other birds of prey, it will actually impale its prey on thorns or barbed wires and use their hooked bill to tear it into bite sized pieces. This behavior is also used as a method of food ‘storage’. Look for the Loggerhead Shrike in open and semi-open areas of short grassland and pastures with scattered low trees and shrubs. It can also be found along mowed roadsides, in golf courses, agricultural fields and open woodlands. Loggerhead Shrikes nest in small trees or shrubs. The females build the nest deep inside the branches. The parents will not usually defend the eggs, but will defend their young very aggressively. When the chicks are able mom and dad help them learn the art of hunting. The Loggerhead Shrike populations have suffered a dramatic decline in the last decades. Unfortunately the causes have been difficult to identify. The threats may include habitat loss and fragmentation, accumulation of toxins in pretty species due to pesticides and territorial competition with non-migratory Shrikes when migrating. Cars and trucks also pose a threat to Loggerhead Shrikes perched along roads. This species lives only in North America, and only the northern populations are migratory birds, flying from southern Ontario and Quebec to United States and Mexico. They return to their breeding range in late March or early April and return south in September, migrating alone. In Ontario their range is restricted to the Carden and Napanee limestone plains, the Smith Falls plain, the Pembroke and Renfrew areas, the Bruce Peninsula, and Manitoulin Island. There have been very few observations within the IBA – largely on the Quebec side of the Ottawa River – but be sure to keep an eye out for this rare species. The similar-looking Northern Shrike can be spotted more readily in the IBA. • This bird is also known as the butcher bird because it impales its prey to feed. • The Loggerhead Shrike can carry prey as heavy as itself with its feet or smaller prey with its beak. • In 2013, only 24 pairs were found in Ontario, and it is believed that only 100 pairs remain in North America. 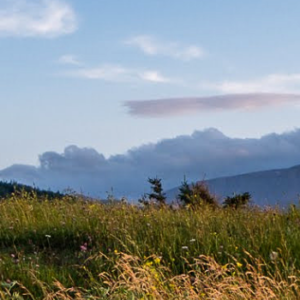 • There is a captive breeding program for Loggerhead Shrike in Ontario and Quebec which has released 18 captive-bred birds between 2001 and 2009. We would like to thank our guest blogger Monica Reyes for this post. Monica is a conservation volunteer for Nature Canada. She is a biologist from Mexico interested in wildlife conservation and environmental education.